Assemblywoman Michaelle Solages’ bill would impose new restrictions on ICE agents in courthouses. Immigration advocates rallied Tuesday for passage of a state bill that would limit the power of federal agents to make courthouse arrests in New York. Dozens of immigration lawyers and activists, chanting “ICE-free courts” and “No Warrant, No ICE,” gathered to announce the Protect Our Courts Act, sponsored by Assemblywoman Michaelle Solages. The bill seeks to protect immigrants inside New York courthouses, including those on their way to and from courts, from plainclothes Immigration and Customs Enforcement agents. This practice instills apprehension within immigrants to participate in the judicial system, which in turn has a “chilling effect,” bill sponsor Solages said in an emailed statement released by the Immigrant Defense Project, an advocacy nonprofit that co-organized the rally with the assemblywoman’s office. Currently, ICE officials are required to produce either a judicial or a civil administrative warrant while making their intention to arrest an immigrant known to court officials, Lucian Chalfen, spokesman for the Office of Court Administration, said, adding that the OCA was unaware of the proposed legislation and will study its provisions. The civil warrant is usually approved by ICE officials themselves, and is not required to be granted by a federal judge, Andrew Wachtenheim, supervising attorney with the Immigrant Defense Project, said after the rally. In many cases, ICE officials don’t even show the civil warrant to court officials, he added. Solages’ legislation, which the Immigrant Defense Project touted as a “first-of-its-kind nationally,” would require ICE agents to present a judicial warrant or a court order approved by a judge for all arrests, including those made for civil violations. “We need to have a court system that encourages [immigrants] to come forward rather than throw them in the shadows,” Manhattan District Attorney Cyrus Vance said during the rally, pledging his support for the bill and promising to “do all we can in Manhattan” to work with immigration advocates. Upholding the legislation’s purpose to ensure due process for all immigrants, Councilman Carlos Menchaca (D-Brooklyn) took issue with Mayor Bill de Blasio’s policy of excluding immigrants who have been convicted of one or more of a list of 170 crimes from qualifying for legal representation. The policy was first floated in budget talks in June 2017, when de Blasio allocated $16.4 million in his executive budget to provide undocumented immigrants legal help, Politico reported. The proposal was only for those immigrants who had not committed “deportable offenses,” the Politico report adds. At the state level, Gov. Andrew Cuomo addressed the issue in an executive order on April 25, wherein he required federal immigration authorities to present a judicial warrant or court order for arrests inside state-run buildings. He also accompanied the order with a cease-and-desist letter to ICE, denouncing their enforcement tactics and asking them to stop making “reckless arrests.” Cuomo threatened to sue ICE to “protect the rights and safety of all New Yorkers,” the letter reads. 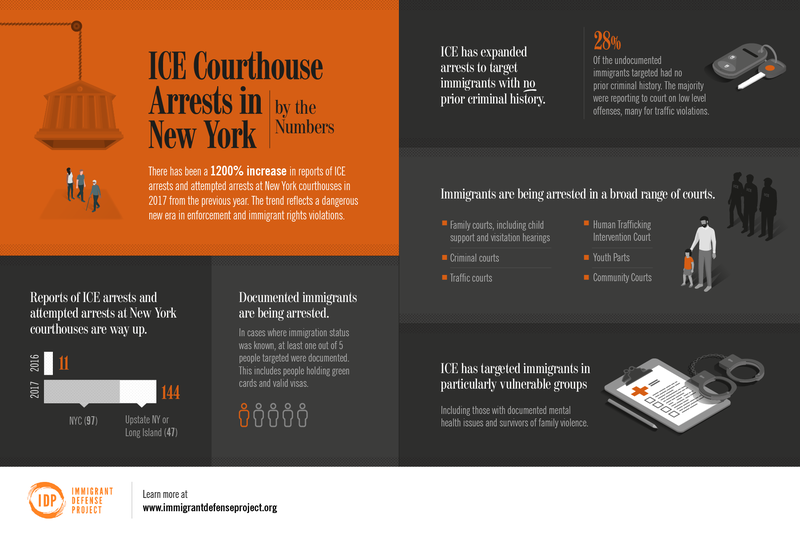 The Immigrant Defense Project recorded a 1,200 percent jump in courthouse arrests and attempted arrests in New York State from 2016 to 2017, with reported incidents increasing from 11 in 2016 to 144 in 2017. Ninety-seven of those were carried out in New York City, according to the defense project report. ICE tactics have had a chilling effect on immigrants, where fear of immigration officials has caused “deep insecurities” and “fear” among immigrant communities and deterred them from calling the police and going to court, the ACLU report finds. The federal agency, on the other hand, has argued that making courthouse arrests is one of the safest and most efficient ways to carry out their enforcement duties, since New York City’s “sanctuary” policies prevent city-run agencies from cooperating with ICE officials and honoring their requests to detain immigrants. From October 2016 to September 2017, ICE requested 1,023 immigrations detainers from the NYPD, none of which the city honored. ICE subsequently released the results of a three-month review of approximately 440 detainers they say the NYPD and New York’s Department of Corrections ignored from January to mid-April 2018. The agency alleges that nearly 40 of those “criminal aliens” reoffended and were arrested by local law enforcement officials again. New York’s policies “force our officers to conduct more enforcement in the community — which poses increased risks for law enforcement and the public,” ICE said in a statement released on June 1.